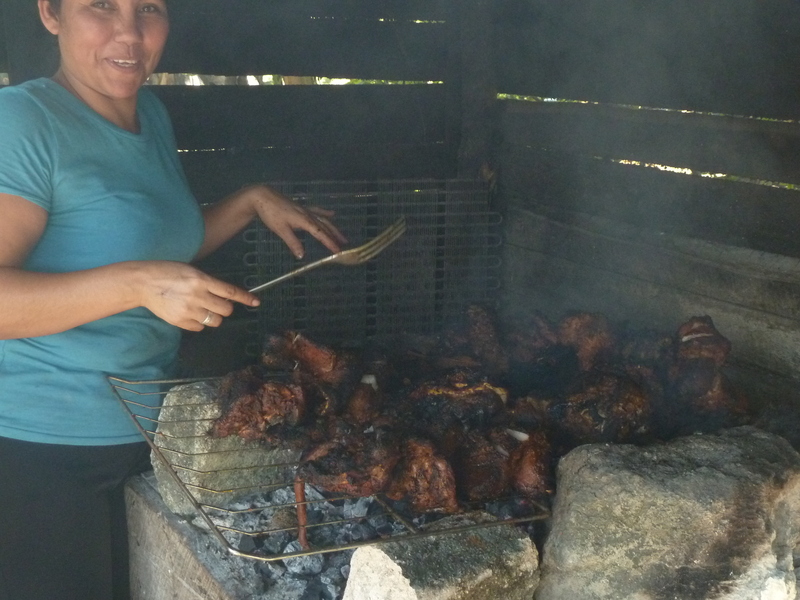 In which I share a few words with you, dear reader, about my pea-less New Year’s Day–and pix from my Christmas in a village in cane country, in the Corozal District of Belize. More pix forthcoming in another posting soon. 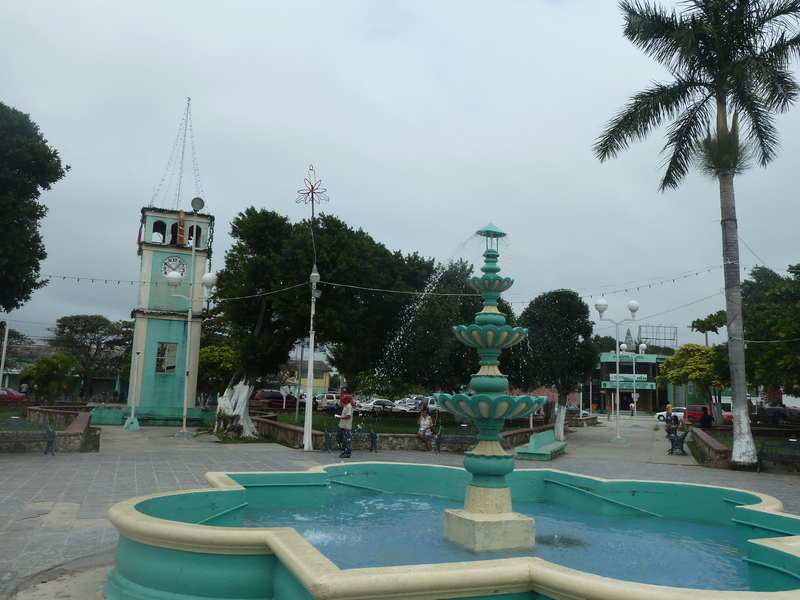 And click here for more about the Corozal area, a most divine place. And choose to have a blessed and happy 2013! Pictured here is what I had for Christmas Day dinner: a pig in which everything was barbecued and eaten except the squeal. Scroll down, read, and view more pix from my Christmas in a village in far northern Belize–near the town of Corozal on beautiful Corozal Bay, near Mexico. Belize has terrific food and every kind of veggie and delectable, tropical fruit imaginable, all produced as naturally as God intended food to be, but good luck finding blackeyed peas for good luck on New Year’s Day. Central Corozal Town in the Corozal District, by the bay in far northern Belize. It’s the bustling town 10 miles or so from the little village where I spend four days and nights during Christmas pigging out. I’m not so sure but what the consumption of blackeyes on New Year’s Day, supposedly for good luck in the new year, is a Southern or even Texas tradition. I just know that this New Year’s tradition was so instilled in me from childhood that I feel a trifle weird today having no blackeyed peas to eat. Maybe there’s blackeyes all over Belize and I just haven’t noticed since I’m not exactly a “foodie.” I just like to eat–and who in this world doesn’t like to eat–but I’m not a real food-conscious person. As long as I have Mexican food I’m good to go, and there’s certainly plenty of that available in Belize, even if a decent, genuine Margarita in Belize is a sad rarity. In fact, I’ve had Margaritas so awful that I sent them back and the kindly Belizean servers or bartenders and restaurant managers didn’t charge me. Proving once again that there is a God and God is good. I had home-made, Belizean-style tamales for supper last night, brought over by Belizean house guests that I hosted, and have enough tamales left over to chow on for a week. The only difference in Belizean and Tex-Mex is that all the tamales in Belize are wrapped in banana leaves, like you get at Gloria’s Mexican Restaurants in Dallas and a few other places in Texas. I almost always had the banana-wrapped tamales when I ate at Gloria’s in Dallas, which was frequently. So getting homemade tamales here–or sometimes from street- or roadside vendors, is one of the best things about life in Belize. Of which there are many good things in life. Like having a Belizean-made Rum with Coke with lime (Cuba Libra) with tamales on New Year’s Eve. It almost makes up for the lack of Margaritas. My friend Myrna, with her daughter and granddaughter, was my kindly hostess at her village home last week. 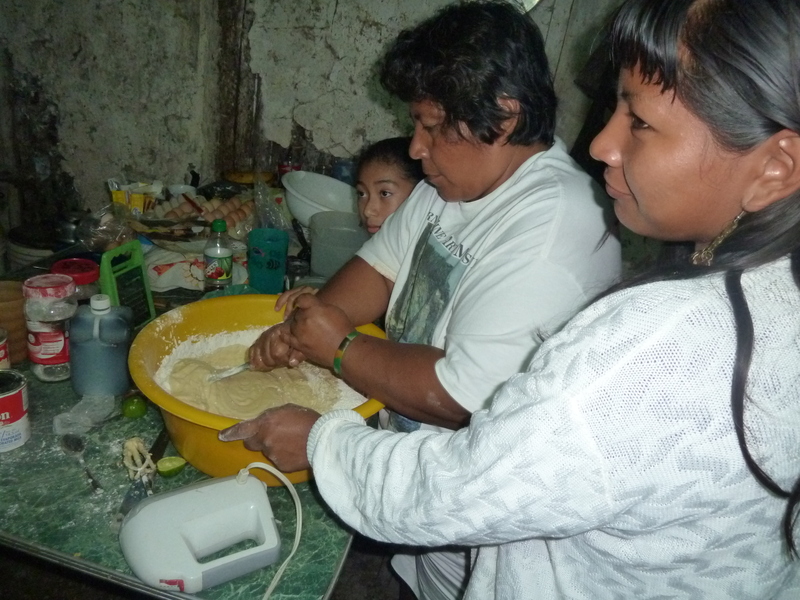 She and her family and neighbors were up all night on Christmas Eve baking and going house-to-house to stir each other’s cakes. Seriously. It was a wonderful way to experience a moonlit Christmas Eve, with carolers walking around and kids popping fireworks and the men barbecuing or just visiting neighbors with their kith and kin at home for the holiday in the village. One of the young men who came home started medical school in Mexico a few months ago. He told me he’s prepping to be an eye doctor and there’s a need for those in this part of the world. (Belize has a serious need for all medical specialists and doctor, in fact.) He’s an inspiration to other kids in the village who see him and see that even a kid in such a tiny village can be something like a doctor. Most village kids slug away with machetes in the cane fields and haul it to the sugar plants. But it’s a lifestyle to them and they are happy to do it–it just doesn’t bring home much income–certainly nothing like medical pay. 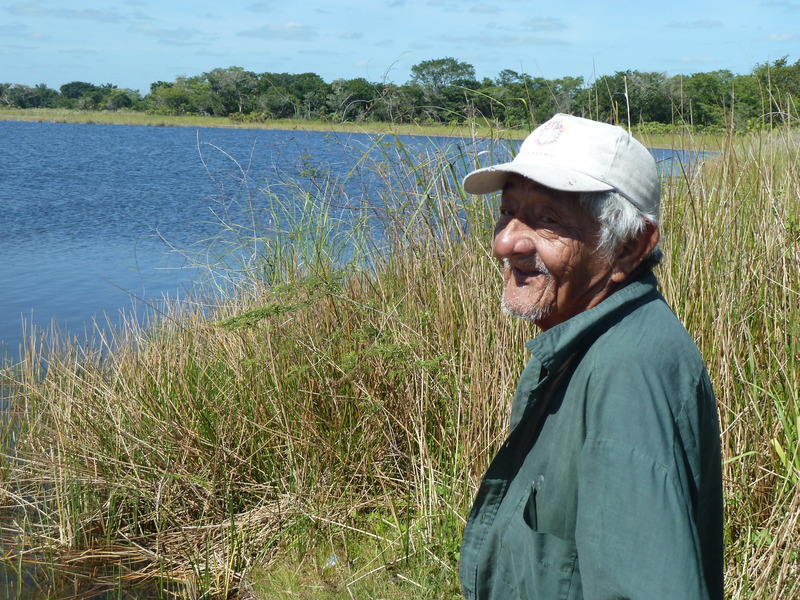 Myrna’s husband, “Pa,” at the lagoon in the cane fields. 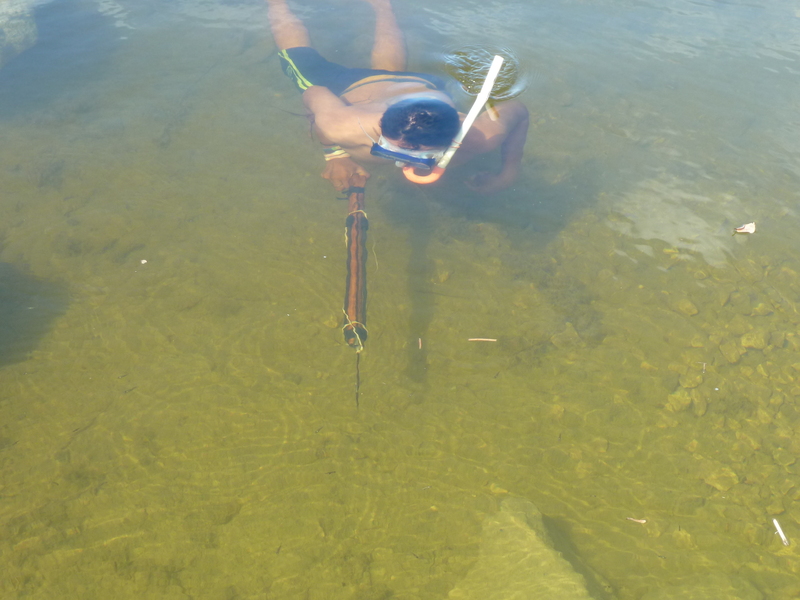 Myrna and Pa’s youngest son, spear-fishing at the lagoon in the cane fields. I tried my hand at it and failed. More pix to come of my Christmas days in cane country. Black-eyed peas are even rare in Virginia but it’s almost impossible to find okra and I LOVE OKRA! Eighty miles southin NC is where okra country starts.